THE DAWN of the radio industry saw various associated trends, fads, and crazes emerge – including the marketing of radio kits to hobbyists, the formation of amateur radio clubs, & the issuance of "Verified Reception Stamps." 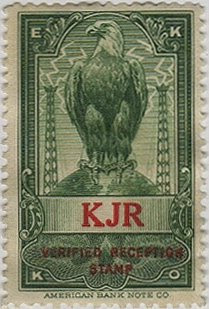 First produced for Chicago's EKKO Company (by the American Bank Note Co.) in 1921, the stamps were intended to appeal to radio enthusiasts whose goal was to keep track of the many distant stations that they'd successfully tuned into. The stamps were sold by EKKO to specific stations who would then provide one to each listener who wrote-in stating the date & time (along with details about the specific broadcast content that they'd heard in order to verify their claim). Those listeners could then assemble their collection of stamps – each bearing the call letters of participating stations – into a book that EKKO began producing in 1924. Among the 800+ stations to participate were Spokane's KHQ, & Seattle's first commercial station, KJR (950 AM).